27 August 2009 - Thought you might like to know that two upcoming new documentaries on the history of Canadian music will feature Bruce Cockburn. We interviewed Bruce for both and feature two of his songs from the 1970s and '80s in This Beat Goes On and Rise Up. 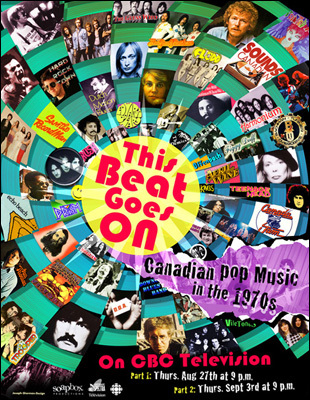 This Beat Goes On is a two-part series premiering: Thursday August 27, 2009 at 9 pm & Thursday September 3, 2009 on CBC-TV. Rise Up is a two part series premiering: Thursday September 10 & Thursday September 17 at 9 pm on CBC-TV.